Last year there were stories that Mastodon’s long-awaited Emperor Of Sand album was going to be their proggiest yet, which caused much debate amongst their fans. While their expertise in harnessing the power of the progressive is unquestioned, when the Atlantan four-piece are rollocking along in a purer metallic fury, it remains wondrous to behold. So, it’s extra comforting that this record has proven to be a masterpiece of contemporary, heavy music. While previous Mastodon albums delve into stories of oceans and mountains, their seventh conjures images of deserts and barren wastelands, with danger lurking just below the surface. Telling the tale of a wanderer facing a death sentence, inspired by the band’s own experiences with cancer in their immediate families, Emperor Of Sand isn’t just a concept on paper; the music within is powerful, defiant and steeped in anguish, and shows the quartet at their most vulnerable. For a band whose sound has previously been akin to that of a fire-breathing monster, a towering metal monolith that destroys all it sees, Emperor…is not so much a beast baring its teeth, but rather its wounds. And while softwareuiphraseguid=“835d4e16-4af3-436e-8174-ac53521cef3c”>Emperor Of Sand isn’t lyrically overt about the cruelty of cancer, the references to life and death throughout are dripping in metaphor. This is music Mastodon needed to write: powerful, passionate metal written and performed by one of the most creative and ambitious bands in our world, and carrying such a weight that it’s capable of levelling mountains. With more in common musically with Blood Mountain and The Hunter than 2014’s hit’n’missOnce More ’Round The Sun, there are riffs here the size of planets pushing the metal ever onward with a spiritual spine to juxtapose the heaviness. 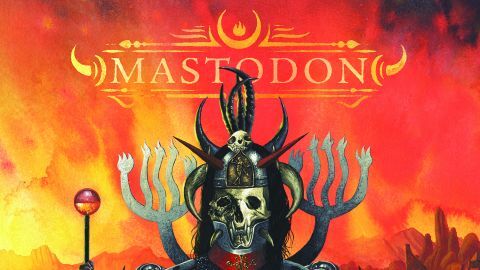 Guitars have played a fundamental role in shaping Mastodon’s sound over the past two decades and this record is no exception. With six-strings dancing around each other on opener Sultan’s Curse and the roaring solo on Andromeda, Emperor Of Sand creates a true smorgasbord for the senses. Just as Gojira’s Magma was considered magnificent on so many levels last year, this is a rich, beautiful record with layer after layer of tear-stained sand to sift through. Those who saw Mastodon’s headline performance at Bloodstock last summer might be thinking that the band are bored of metal and are more interested in prog, but here they’ve retained their razor-sharp metallic edge. The rumbling highway of Show Yourself, the gigantic guitars of Roots Remain and the instant heaviness of Clandestiny prove that Mastodon are still very much a metal band. But the MVP award on the tracklist goes to Steambreather. Backed by a cosmic downtuned groove, the bellowing chorus and heavyweight instrumentals fuse together into a Herculean beast that earworms its way into your brain, and is guaranteed to become a set staple. Big choruses, however, are the real cornerstone of this album. From tales of falling into a pit of lies, saving yourself and a prophecy being realised, these are huge sweeping lines of life, death, and the joy of existence. It’s not a happy record, but it’s defiant, emotionally raw and hugely resonant. Being alive is the one thing we all have in common, but it takes a band as special as Mastodon to put life into perspective.